When you’re working around traffic, safe management of the work area is critical. You can help to keep yourself and your crew out of harms way with the right high-visibility equipment. 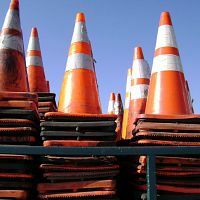 Sharecost Rentals can help supply your next traffic control project with traffic cones, traffic barriers, high-visibility hand-held signs, and more – all at affordable rates. And if you’re looking to purchase, we have you covered there as well. Keep scrolling to see the various traffic safety rentals we have available. This page is under construction. More rentals are being added soon! Be safe! High visibility Day and Night reflectors on 5’ to 10’ barricades will protect your work area from vehicle and foot traffic. Barricades have 36” stands included.